Ramps Support up to 850 lbs. 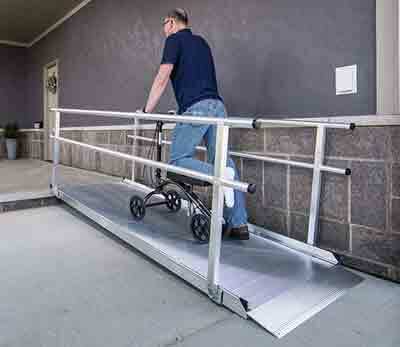 Gateway Wheelchair Ramps - Gateway wheelchair ramps are a smart alternative to costly wooden ramps. These handicap ramps with handrails feature a seamless, permanent non-skid driving surface that is safe, secure and ideal for scooters, walkers wheelchairs, canes, crutches and more. Heavy duty and extra wide wheelchair or scooter ramp features an 850-pound weight (bariatric) capacity and easily accommodates wider chairs. Gateway Ramps without handrails to see the Gateway Ramps without handrails in 3, 4, 5, 6, 7, 8, 9 or 10 foot lengths. Please note: Handrails cannot be added to the standard Gateway wheelchair ramps later (they are not made to accept them) and they are a solid ramp and do not fold. Quality American Made Ramps, Built to Last! 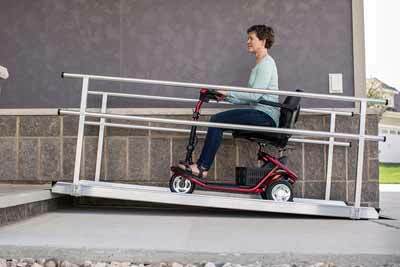 - Gateway wheelchair and scooter ramps are designed for the rigors of repeated everyday use in all weather conditions. Extruded aluminum construction gives the Gateway ramps a clean and modern appearance that will coordinate with any home or business. 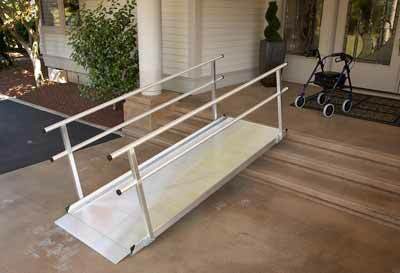 This lightweight handicap ramp with handrails is ideal for temporary or semi-permanent handicapped access. 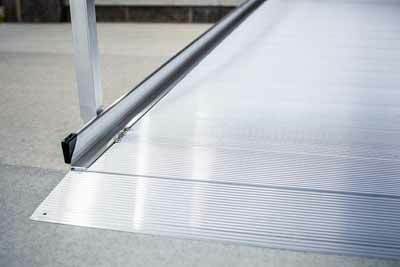 Gateway wheelchair ramps are available up to 10 feet long and are equipped with an edge on each side for safety. 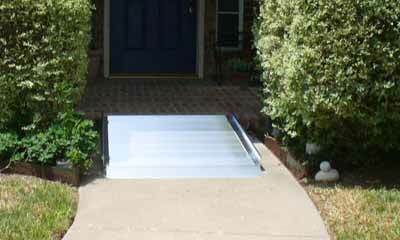 Gateway wheelchair ramps are made of aluminum, so you can leave them outside year round without rusting. 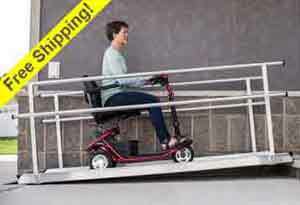 Factory Direct Shipping - Most Wheelchair Ramps ship the same day you order! Gateway Ramps: Solid non-skid surface that is perfect for Scooters, Wheelchairs, Walkers and more. 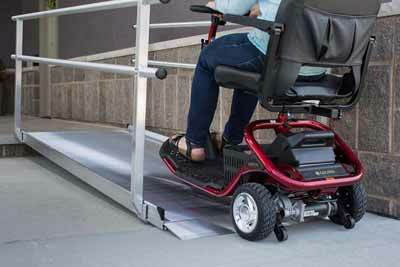 Gateway Ramps: Durable aluminum construction makes it strong enough to leave in place all the time or a portable ramp. 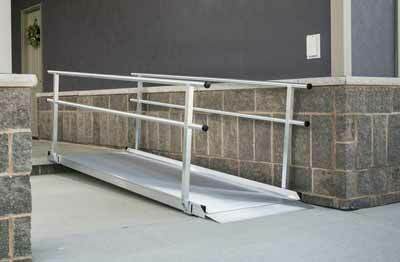 Gateway Ramps: Smoothest entrance on/off the ramp for comfortable handicapped access.